When you’re planning to invest in precious metals it’s tempting to put most of your effort into deciding what to buy and how much of it, and these are both important points that you need to get right. There’s another major factor, however, and many people don’t give it the attention it deserves. That can lead to unexpected costs and, in the worst case, serious financial losses. This factor, of course, is how to store your metals once you have them. You have three main options open to you for the storage of precious metals. These are to store them yourself, usually at home; to keep them in a bank; or to make use of a specialist metal depository. They all have benefits and drawbacks, so let’s look at them in more detail then explore some of the issues involved. The simplest solution is to keep your investments at home. Of course it’s not a good idea to just stash everything at the back of your sock drawer; the biggest risk of self-storage is losing your assets in a robbery, so some security precautions will be necessary. The most common is to install a safe. These come in many sizes and security levels; larger ones are usually too heavy for a thief to remove. For maximum security a safe needs to be securely fixed to the structure of your home – that means bolting it to a solid wall or floor with bolts that can’t be accessed from outside the safe. A safe isn’t an impenetrable barrier but what it will do is increase the time a thief needs to grab your gold from seconds to, if you buy a quality one, hours or even days. It will also protect its contents against fire, flooding and other damage. Bear in mind that not all safes are rated as protecting against fire; we strongly recommend that you get one that is. They do cost slightly more but considering what you’re storing inside it makes no sense to cut corners – especially if your assets include certificates or cash. The other option for home storage is to conceal metals. A safe can also be hidden, although obvious places like behind a painting aren’t a good idea, but bars or coins can be concealed in many ways. Properly packaged metal can be plastered into a wall, hidden under floorboards, loaded into plant pots or simply buried in the yard. If the hiding place is good enough this is a very secure method, and it’s usually cheap too. If there’s one obvious place to store valuables it’s in a bank. The most common option here is a safe deposit box. These are basically small safes, installed in a bank branch, that can be hired by private individuals. 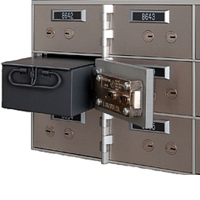 Safe deposit boxes allow free access – when you hire one you get a key, so as long as you can get into the bank you can open the box any time you want. Boxes come in various sizes; the smallest ones, which are usually 18 to 24 inches deep with a 5 by 5 inch door, cost around $50 per year to rent. A box like this will hold a reasonable quantity of coins or small bars. Larger sizes are also available and cost up to around $200 per year. 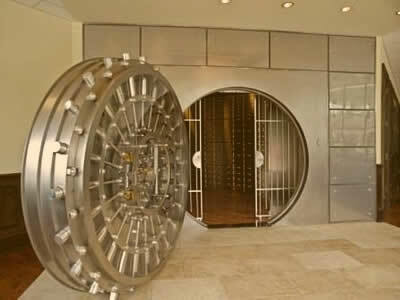 Some bank branches also give the option of storing valuables in their vault. Physically it’s similar to a safe deposit box – you rent a box which, for added security, is kept in the vault rather than inside the public area of the bank. This is a more expensive option, with small boxes often costing over $300 per year. The final option is a depository. These are private companies that specialize in storing valuables – many of them deal exclusively with precious metals. These are a very popular option and the cost is often comparable to a safe deposit box. Protecting your investment is perhaps the most important task of your storage method. Each of your choices has strengths and weaknesses. A safe will delay a thief but with power tools, or even a thermal lance, a determined intruder can open most safes if they have enough time. Protecting the safe with an alarm system can reduce this vulnerability; a good safe that’s securely mounted, well concealed and connected to an alarm will deter most attackers. One sensible precaution is to buy the safe with cash and install it yourself; the fewer people who know you have a safe full of gold in the closet, the better. The other option is concealment and the security of this method depends on how imaginatively and thoroughly you hide your metal. If you hide your coins in a cavity in the wall, plaster over it then redecorate the room the chances of a thief finding them are remote. On the other hand if they do get found you’ve lost them, and no insurer will cover precious metals that aren’t kept in a safe. A bank or depository offers a very high level of physical security. Their alarm systems make it unlikely that any intruder will have time to open boxes before the police arrive. There is another security concern though, and that’s confiscation. It’s very unlikely but it has happened before, in 1933, when the federal government compulsorily purchased almost all private gold holdings at a low price. The chances of it happening again seem remote but it isn’t impossible, and if you’re stockpiling precious metals as a hedge against an economic collapse this could be a factor for you – an economic collapse is when a confiscation is most likely. The final thing you need to consider is how much access you need to your investments. If you’re accumulating metal as a long-term safeguard you may not need to access them regularly, but if you’re a more active investor it could be important to you that you can retrieve them at short notice. This is where self-storage is definitely the winner. Unless you’ve concreted a bag of coins under your patio you can get access almost instantly and that’s excellent news if you need to respond to sudden changes in the market. If spot prices peak you can immediately retrieve your holdings and sell them. On the other hand, if you need to sell outside bank opening hours anything you have in a deposit box or vault is out of reach. You’ll have to wait until the bank opens for business again, and if you decide to sell at the start of a long weekend things could have changed a lot by the time you can get into your box. This can be even more of a problem with a depository, where you might have to wait several days to have your metal delivered by a secure shipper. Like most other important choices there’s no clear winner – each of these storage options has strengths and weaknesses. The one you opt for will depend on your own requirements. Of course there’s no reason to stick with one. You can keep the bulk of your precious metal in a bank vault or depository, but hold part at home so you can convert it to cash at short notice if required. It’s always a good idea to regularly review your plans, too. Not only can your needs change over time, you’ll also gain experience as an investor and that can affect your choices too. In any case it’s an important enough decision that you need to get it right.